Nomad List promotions help you grow your audience by reaching millions of traveling remote workers around the world. 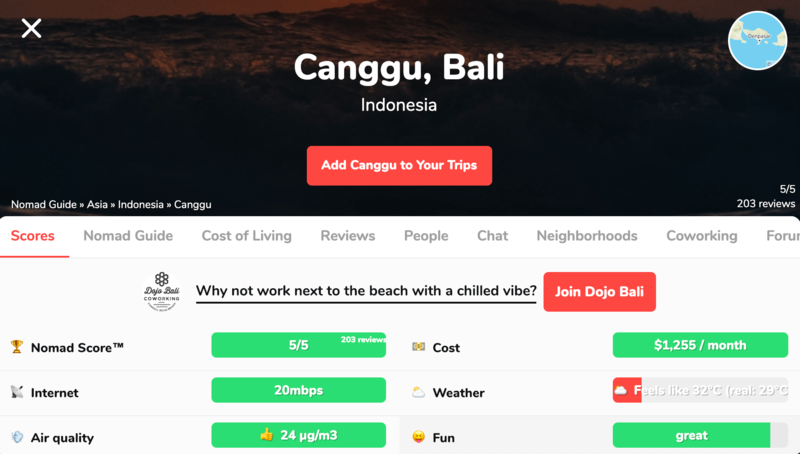 Your promotion appears on a city page on Nomad List, below the tabs bar and above the content (see Dojo Bali's promo above), reaching potential new customers as they explore the place they're going. That means you can target customers specifically that are visiting there. This is useful for coworking spaces or cafes trying to get more traffic, or businesses targeting nomads and remote workers. Promos run for 30 days from the date of purchase. All prices are in US dollars. Purchasing an promo means your agree to the terms of sale below and terms of service. * The estimated performance metrics above are updated daily from current promo performance, but do not guarantee the performance of your purchased promos. Ad viewership varies over time, and response rates depend on the quality, content, and relevance of your ad. After each city promo is sold, the price increases for the city. If a city's available slots do not sell for at least two days, the price will reduce daily until one sells. If a city is usually sold out, its total number of promo slots will occasionally be increased. Expirations, availability notifications, and most price changes happen shortly after midnight PST. Nomad List may edit promo content for technical, layout, or style-conformance purposes, such as resizing images or performing minor copy edits if necessary. Once you purchase an ad, it must be approved by Nomad List before it goes live, which typically occurs within 24 hours. Nomad List reserves the right to reject an promo for any reason, such as (but not limited to) billing issues, miscategorization, quality concerns, or content. Promos are only shown to visitors not members. The majority of Nomad List traffic is not a member (400,000 people/mo) though so that's in your interest. Members (about 3,000/mo) pay to remove promos so we can't show it to them. Promos for shows primarily about personal investing, real estate, debt management, or similar topics are permitted only in the Business category. If your promo is not accepted, your payment will be refunded if possible, with the refund pro-rated if the promo has already run for a portion of its purchased duration. Heavily inspired by Overcast FM's promo system. Need help? Have feedback?If you'd like to change your username, update your card, cancel your membership and other account changes, do this yourself on the Settings page instead. If you're having any trouble, found a bug, or have feedback, please write it here:Thanks for the message! I will get back to you soon.